I know at least one person has done that, and she said it worked. I’m not sure how exactly it would work though because the ratio of egg to flour is set based on the super high fiber content of coconut flour (it soaks up a ton of liquid). If you were going to try it with almond flour, I’d probably mix it, then see if you need to add extra flour to get a thick batter. This looks like the answer to my GF prayers. I’ve been looking to make a simple flatbread with the ingredients I actually have in my cupboard. Except for the parmesan, I have everything else. I actually have some ground turkey that I plan to use to make a Turkey burger. So glad I happened on your site! Lisa, I made this tonight and it was yummy! I added some garlic powder and a bit of rosemary. One thing i did to make it a bit crispy on the outside of the sandwich is i sprinkled a bit of the cheddar i shredded for the sandwich on the outside and it got crusty – yum! 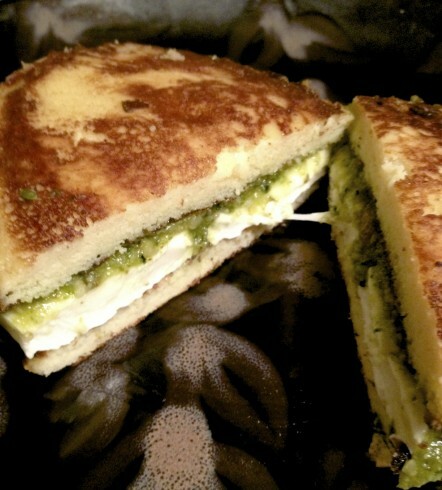 I can’t wait to tweak this for other sandwiches and also a sort of garlic cheese bread! ahhh! Thanks so much for posting this – i eat mostly grain free but so many bread recipes are filled with nut flours and cheese and so fattening. Awesome! Love the idea of sprinkled cheddar on the outside! I’m definitely going to try that Thanks for the feedback–this recipe really has been amazing in my life so I’m happy to hear when other people like it too! These came out great! So glad I found this recipe. Very versatile. 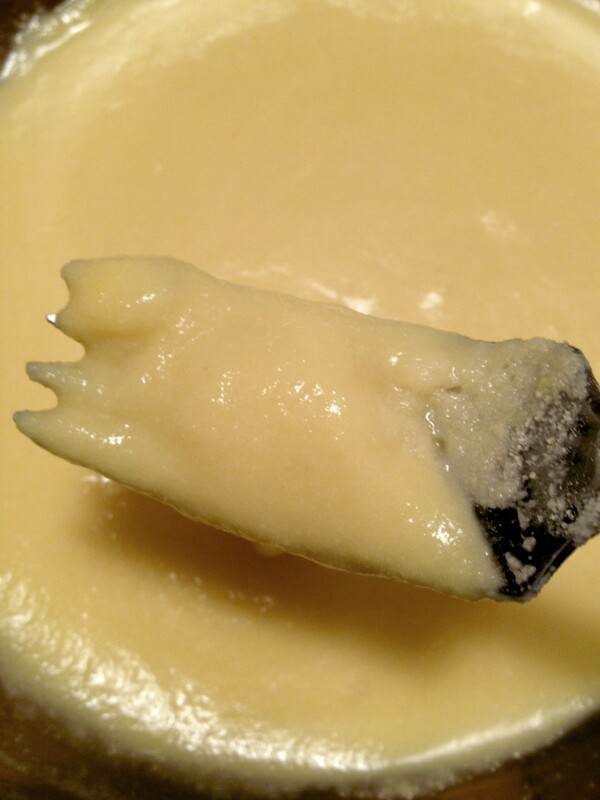 Just wondering if anyone has tried baking the batter instead of frying and, if so, how did It work? This were better than I expected! I made it twice today. My toddler loves it too. Yay! Finally something that is truly comparable to a pancake/tortilla/sandwich bread! I’m so excited to try it with tacos. Yummy. 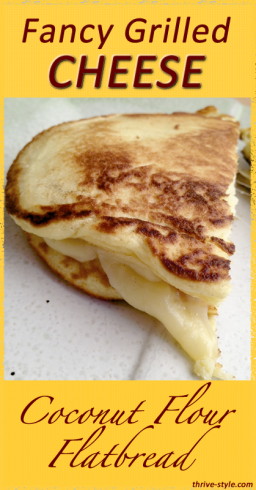 We are gluten free and have tried many a recipes and while good, nothing compares to this recipe! Winner in our book. Hi! I don’t actually know why it happens, but using real dairy (half n half or heavy cream) makes the bread fluffier and then the baking soda/powder aren’t necessary. I discovered this just because I was lazy—I left those out and realized it didn’t make the bread any less fluffy than with it (then later I tried it with non dairy milk—can’t remember exactly which type—and they were pretty flat without the baking soda/powder). Overall, the fluffiest bread comes from using half n half or heavy cream (I can’t detect a difference between the two), and if you mix the batter really well and let it sit for a few seconds (a minute maybe?) before putting it in the pan. Honestly, I think the brand of coconut flour makes a difference too. I buy bob’s red mill out of convenience, but I think Coconut Secret makes it fluffier. If you try it, I hope you like it! Has anyone tried making these in a big batch and freeze? plain and one with 2t. cinnamon and some dried cranberries. Very good! And I spread with strawberry whipped cream cheese spread…. I am always on the hunt for an easy, yummy breakfast. So easy! I did have to add an extra 2T milk (I used almond) but maybe due to our dry climate? I made a grilled cheese with mozzerella and dipped in a little pizza sauce. It isn’t bread of course, but I will make it again! Thank you!! Can’t wait to make this soon! Was just craving a grilled cheese this morning and couldn’t think for the life of me how to make it happen and keep to my paleo lifestyle. Bless you, sweet angel! In a desperate search for a “bread” recipe. Unfortunately, I do not like this one. Tastes like a sweet egg sandwich. where is the nutrition chart for this wondering how many carbs are in this. Just tried my first one, wow, used heavy cream with b/s and b/p. I made one big one and let it cool, topped with avocado and chicken salad. Everything was very creamy. 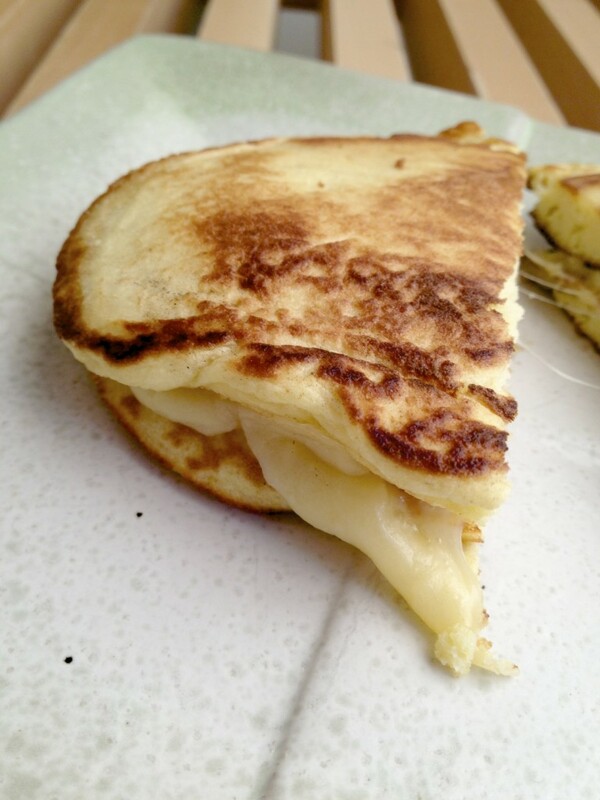 Thinking of another idea and adding a bit more liquid to make it more like a crepe and then use it to bake low carb items inside (cheese enchiladas). But definitely great for sandwiches. The better quality of cheese the tastier the sandwich. That is what I am trying next… the filings are endless! Forgot to take a picture, Doah! Just made these as your recipe states . I always try to make things as recipe states and go from there . Very good indeed . Used swiss cheese as that is one of my favorites . Used butter to fry them . I am going to try making some ahead to take for work or maybe even toast . Thank you so much for this recipe . Thanks! So far I’ve found coconut-based breads to be too eggy – more like quiche than bread – but toasting it might help. I certainly miss grilled cheese. Will definitely give this a try! it’s really more of a pancake, isn’t it? Just made these and are very good! 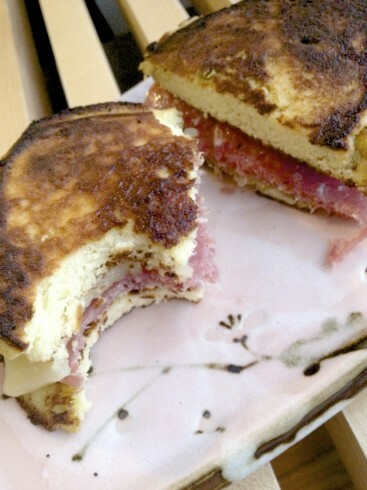 They tasted quite similar to pancakes to me but made a really yummy grilled cheese and ham “sandwich” (more like a McGriddle). I made one batch with half/half and one batch with almond milk just to see the difference and both tasted the same to me. I also used 1 tbsp of olive oil per batch instead of butter. 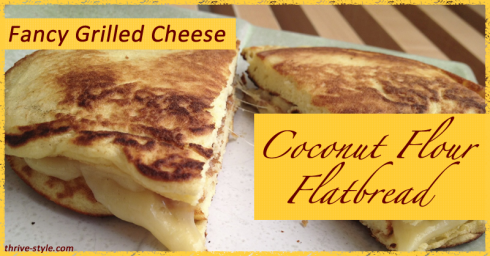 I had another coconut flatbread recipe but it comes nowhere close to this one. It’s so yummy and so easy to make. Thank you!!! Since I started low carb diet bread is the thing I miss most, but not anymore! 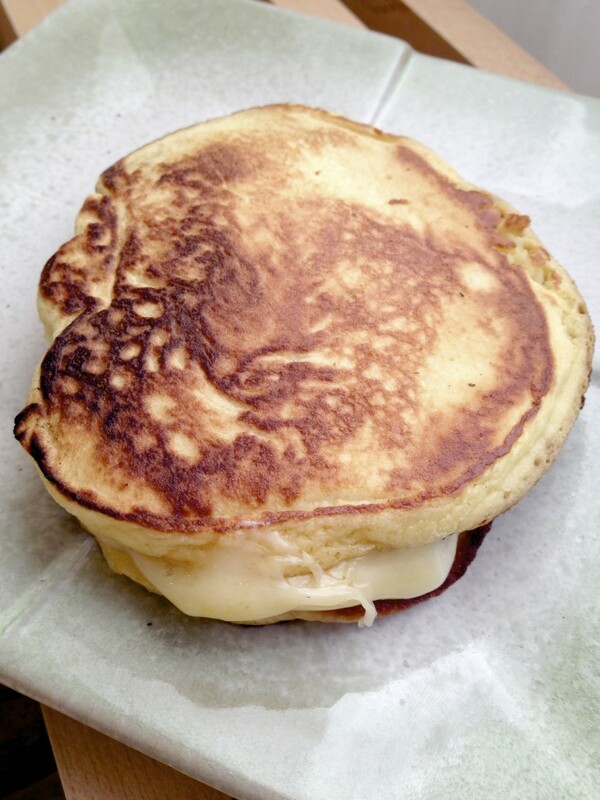 very much like a pancake, but what bothered me the most was the very strong tast of coconut!!! has no one noticed this? I added spices, but even then it didn’t hide the strong coconut taste. I’m sorry, but I don’t want a sandwich that tastes like coconuts! I really wanted to have liked it though. I can’t thank you enough for this recipe! It has seriously changed my life lol. I love love love it – it’s one of the first things I’ve ever made with coconut flour. I love to add minced onion, nutritional yeast and sometimes curry if I feel like it, then pile it high with lean turkey, real honest to goodness sauerkraut (not the stuff from the store in a jar or can or plastic bag), some mayo and deli mustard. I could eat that every day! I’ve been gf for a couple years now, so this easy and tasty “bread” is wonderful. Thank you thank you thank you!!! I just tried this and have no idea what I did wrong. it was too liquid. I’ve never used coconut oil. Looking on Amazon.com. What brand do you suggest? Made these tonight, using 1/4 of a teaspoon of bicarbonate of soda and adding 1 teaspoon of protein power. Omitted the Parmesan. Sprinkled them with chocolate chips before I flipped them over and my fussy kids devoured them with in seconds. This recipe is a keeper!!! Made these for grilled ham and cheese tonight. They were very good. Did one with salami and swiss. I think trying different cheeses and fillings is in our future. I used some Italian seasoning in the batter for some and Cajun seasoning for another. Thanks for posting this recipe. Unfortunately mine tasted like eggs and even smelled like overcooked eggs as I was cooking it. It did, however, look exactly like the photo. Everyone else has had great success with the recipe so I am wondering if I did something wrong or am just sensitive to the taste of eggs. I used almond milk for the liquid. My coconut flour is a couple of months old perhaps that could be it too. I will try again in the future to see if I can get a better result. For those of you who asked, I did a quick calculation based on figures found on the USDA nutrient database. These figures are based on using heavy cream and no baking powder (baking soda adds nothing either way). The carb content would be about the same in either case, however the fat and cholesterol would be totally different. Also, this does not include any fillings for the sandwich; it’s just considers the flatbread. Just made this and found that it would work really well for Indian Fry Bread, AKA “Indian Tacos”. Pairing this with seasoned ground beef, Queso blanco, kale, sour cream and some black soy beans (high fiber count = 1 net carb). Thanks for the recipe! To me, it is kind of like an omelette grilled cheese. The “bread” had a texture like a thick crepes. Interesting. I am going to play with it a bit. Thank you for the recipe! I know I’m waaaay too late to post a comment here. But, I just found this recipe and just tried it. I wasn’t expecting much b/c I didn’t have coconut flour and used oat flour instead. The “bread” turned out *really* tasty! Since I was hungry, I made another batch. This time I added some thyme and made 2 thin wraps, instead of a bread/pancake. oh-my-goodness! Thank you for posting this recipe! It was delicious and I can see it as a staple in my home!!!! We don’t eat breads or cakes, but I missed it sometimes. I’m happy to now have an super-easy option for a quick breakfast or dinner! Thank you thank you!!! Btw, if you don’t use heavy cream but for instance unsweetened almond milk the nutritional value is only 57 calories per serving (excl. the butter you use for grilling… I used coconut oil). Hi first of all I’d like to thank you for all these wonderful bread recipe. Today I made this bread. While waiting for the batter to sit, I made spinach,sausage with cheese. I did some adjustment though, I used drink yogurt instead , and Italian seasoning. It turned out very delicious too. Thanks again. A sweet, rum-based cocktail made with hard rum (Jamaican if you have ) , best coconut oil, and pineapple juice, usually served either blended or shaken with ice. For the finishing touch, Ghiradelli Dark Liquid Chocolate dropped in the center.